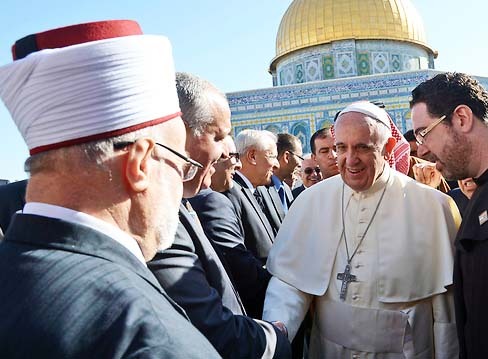 Pope calls the sons of Muhammad “brothers” on the Temple Mounts. The pontiff, accompanied by the Orthodox Patriarch of Constantinople Bartholomew, recalled that the three monotheistic religions all have the same patriarch, Abraham. He then entered the Dome of the Rock, taking off his shoes to step into the gold-topped dome, which enshrines the rock where Muslims believe the Prophet Mohammad ascended to heaven. No true Christian will ever call the Grand Mufti of Jerusalem “a brother”. The Mufti is an anti-Semite with Jewish blood on his hands. 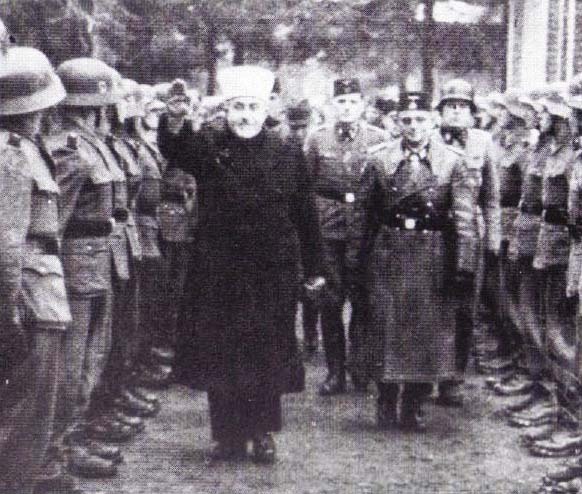 During World War II, the Mufti supported the Nazis. Today He works for the Islamic re occupation of East Jerusalem. But equally serious. The Grand Mufti persecute all Arabs who claim that Jesus the Messiah is eternal God. He curse any person person who do not stay put in the erroneous doctrines of Islam. He supports people who curse their children, to not believe in the salvation in the blood of Jesus of the Messiah. 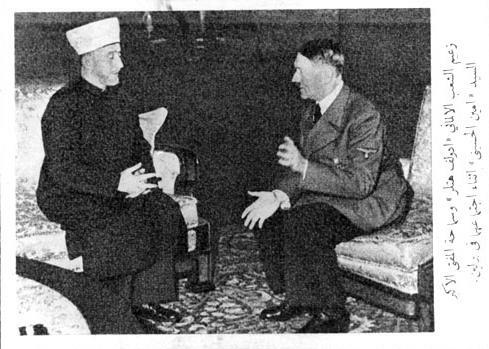 The Mufti of Jerusalem was a Nazi. Her he is inspecting Muslim paratroopers in Croatia, ready to be sent to evict the British from Jerusalem. The Mufti with Hitler in Berlin in 1942. By his blessings of the Grand Mufti of Jerusalem, the Pope reconfirm that he is an antichrist. Neither do He represent the God of Israel. Nor is He the vicar of the Jesus the Messiah. Do not end up in the wrong camp, supporting the Papacy. Do never end up in a congregation hailing the “Holy See” as a Christian leader. If the pope calls the anti Christ Muslims as brothers then he is joining in the rebellion against the great God and saviour Jesus Christ.All Catholics should be aware of this blasphemy. I want all Christians to say it load and clear: The Pope is an antichrist. For sure, the Pope is an Antichrist. I strongly suspect The False Prophet will be a Muslim descendent of Muhammad. So it’s no surprise to me that the leader of the Great Harlot is pally with Muslims. May I be a little bit cheeky, by informing you of an excellent book that covers the subject by bringing together the many biblical and historical facts, as well as Gematria into an investigation that points to a Western Prince, who was born the same year as modern Israel, and who claims ancestry back to King David. You can find out more by clicking on my coat of arms.